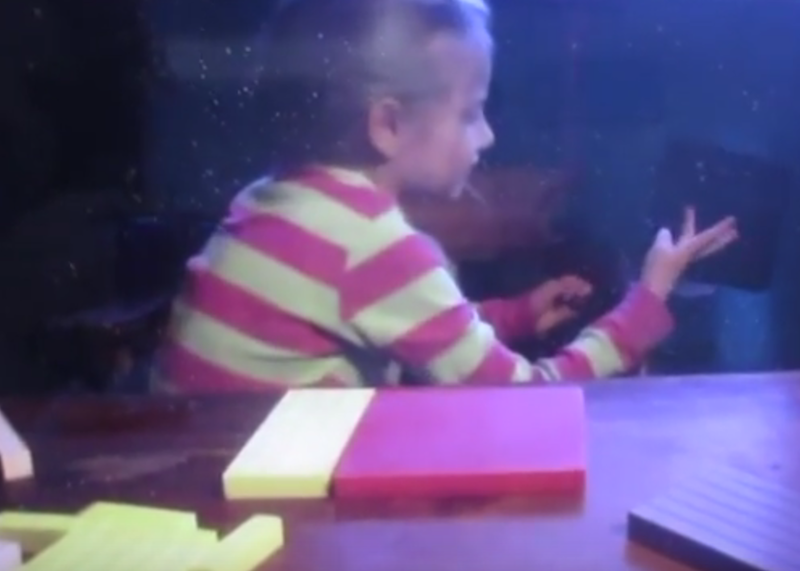 This little girl is doing some pretty big math. Algebra doesn't have to be hard or scary. It' can be exciting easy and fun. I admonish all parents and teachers using this method to introduce algebra early. Four and five is not too young, Little kids enjoy algebra, especially when they don't know it's supposed to be hard. In kid culture, they do know algebra is supposed to be hard. So when they see themselves doing algebra and it's easy and fun they think that they're smart. Their self talk is superior to those failing algebra, I assure you. The idea here is to introduce concepts gradually, but you'll find that with this method we cover a lot more ground a lot faster than the traditional symbol-based approach. Using base 10 blocks makes algebra visually obvious and so easy even very little children can do it and have fun at the same time. Compare and contrast this to symbol based approach which often results in teenage tears. The problem I see in many mah textbooks is that they introduce too many concepts at once. This makes the "cognitive load" too high and algebra becomes frustrating. Instead, using base 10 blocks they can get their hands on it and we introduce one concept at a time. The algebra is actually used to teach addends and multiplication facts. So a concept is introduced, we play with it, another concept is introduced and then we play with that. While we are learning math concepts we are counting. But again don't be confused, computation is not all there is to mathematics. Mathematics is the development of logic and reasoning. While we are learning basic math concepts, 45 addends and 400 multiplication facts can be internalized for instant recall not just memorized and forgotten again. The fact that she still on her fingers doesn't matter either. 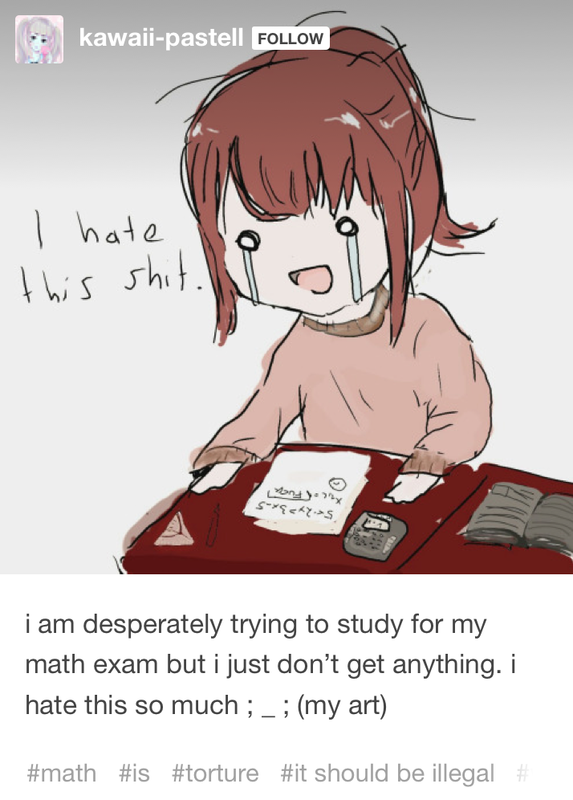 Neither does the fact that she couldn't write all of these problems down quickly. In fact if we took the time for her to write them down it would slow the lesson down to the point where he wouldn't get anything done. Learning math concepts can be done whether or not the child can write, in fact her ability to write is not reflective of her ability to learn math at all. Public schools seem to have this confused. Mathematics is intrinsic to the human mind. Concept based teaching of mathematics with base 10 blocks not only speed the process up but removes a lot of the pain. In the short eight minutes we introduced some very powerful and important math concepts. The concept of the exponent, distribution; we reinforced counting by fours and nines did addends for 11 and 12 and 13. We didn't do stale worksheets. It wasn't boring, it was fun: child's play. The deck is definitely stacked against little girls. In 2017, we still put little girls at a disadvantage. There still told math is a "guy thing." Girls are often discouraged from participating in math and science even if it's unconsciously. And mathematics is still taught to the male visual learner. Kinesthetic female learners usually have a difficult time with mathematics. But this method levels the playing field. I charge $50 an hour or for $200.00 you get five classes. All you need is gmail vid chat and A set of blocks. This little girl could use a playmate and I have one other little girl would also like of playmate too. If $200.00 is out of your price range, for $36 a month you can get passwords that allow you access to a plethora videos and webpages that show you how to do it yourself. For example Raymond's page, shows you how to start off very young children. But there are many more password protected pages than that with PDFS and more. Subtraction when done right should be easy and fun. All it takes is the proper method and a little practice. 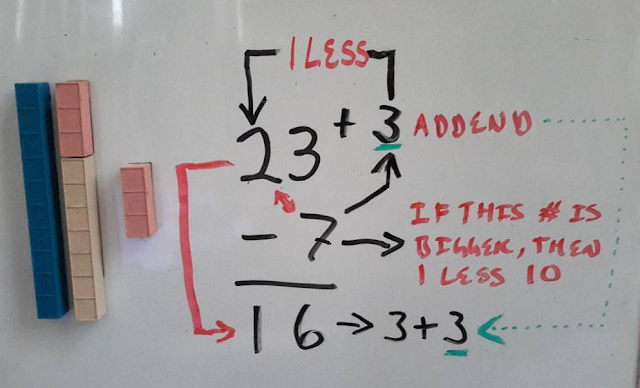 In this video you see intermediate supremely simple subtraction. Where we are not just taking away one digit...but two. With a little more practice, long strings of digits can be done quickly and easily. I don't see why it's difficult to train your child to understand if that number is bigger than that number then this number is one less... And if the number on the bottom is bigger just add the addend. And little more practice you can go from left to right instead of right to left. The idea is to make computation fast and easy. It is amazing to me that we have fallen down this early on in the teaching of mathematics. This is just subtraction, it shouldn't be hard. 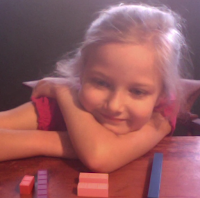 If you want to make subtraction easy and fun for your kids just click the link. Supremely Simple Subtraction. Basically what you see here is a math rich environment in action. Playin is learning. Play with the stuff they like to play with... In this case playdoh and manipulatives, or base 10 bucks. This screen cast got over 150 hits in a day, I'm pretty sure people were amazed by their ability to multiply more than by the playdoh but you never know with the Internet. Basically we played and had fun first and learned math concepts second. this play session lasted about two hours you'll the complete lack of symbols interplay we just talked about the concepts, the symbols will come later. Here you see us playing with addends and subtraction. A lot is going on here... You see Hero Zero wearing his five disguise at the top, first it was a 10 and we made addends for 10 below it and the four-year-old showed me ten take away one in no uncertain terms. Here we see an addend for seven and a couple cutouts. Here you can see how the boys lined up and press them in. And here we are getting ready for addends bigger than 10. Talk about making impressions, here we see 6+4 really is the same as 7+3, and they're both the same as 10. So what if they don't line up perfectly? They still "get it" and that this age the emphasis is on fun not on being didactic with clay. You can't play "wrong." Cutouts for the one I don't talk about talk much about the video. And you don't see it much here either but we did all kinds of map of the cutouts, mostly adding and subtracting and smooshing together. Then we started playing with fraction, under my direction... It's play but it's directed play. "Why don't we..?" "What if we..?" "What would happen if..? ""Can you make a square and cut it up?" Looks like an American cheese single. And right there I got about 100 ideas for lessons with a pack of cheese singles... Eat your math lessons, that will get them subtracting--assuming you like eating processed American mucus forming, chemically enhanced for optimum flavored cheese-like substances. I wonder if I could get Kraft as a sponsor. Anyway I can see lots of lessons that could be done with cheese singles. This gives a good chance to practice coming by fours and to see 4/16 is the same as one quarter. You can also see a relationship of 1 to 3, 1:3, but we did not talk about it at all I mention it here because it's so blatantly obvious we could show it equivalent fractions the other way keep it simple and fun and don't try to stuff too much in there at a time. Older kids and adults might be ready to make the switches between the two but with the toddlers I made sure it was a coherent lesson with no jumps and perception. It's one square with a strip colored in as opposed into rectangles, one over the other to show ratio and equivalent fractions of one third that way. This one square teaches a lot of math to toddlers as it is. his could just as easily been a lesson about right angles and squares and square root. The older boy wants in on the action since you did such a good job accounting by fours and sixes. But the younger boy would like to know that he did all the "work." Bigger is funner. Here we put together a 6 x 6 square and talked about fractions as we did it can you see that fractions and multiplication go hand-in-hand and that you can't teach one without the other than that you can teach multiplication with fractions. Why not teach fractions while you teach multiplication or why not teach multiplication with fractions? Since it was all cut up already or use a six to show one out of six or 1/6 and that was the same as 6/36 or six out of 36. Again they didn't see any symbols and we didn't do any writing during the lesson. But when they do see them, the symbols will make sense. Just for fun, here's one of 36. 1/36. And since they had some purple Playdoh, they made six out of 36 themselves. Again I see you ratio listing here 5 to 1 or 1:5, but we didn't do it. You could if your students are a little older. Or as a separate lesson. Them we made it smaller and talk about fives and fifths each blue-black is one of five or 1/5th. Of course conking my fives is easy and fun. Which is the same as 2/10ths, and here you see them using their imagination to break it into tenths. It was fun rolling out the skinny lines and making stuff with them. I missed taking pictures of them playing with the yellow flat and showing other fractions and fraction concepts. But you get the idea. And after we played long enough with these concepts we just crunched it all together and started over again. "What should we do next?" the four-year-old asked. "I dunno." I said, "let's just play and see what happens." Here is a video for the boys help me tell the story. Caution: they may blow your mind with their ability to count. At the time I made this post using YouTube and Screencast-o-Matic had outages that were commonplace. I put screencasts here for all my teacher friends who have YouTube blocked at skool but then the screencasts stopped working so now I'm going back and finding screen casts that don't work and am replacing them with YouTube vids or links. 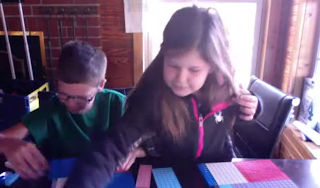 This screen cast is titled "Crewton Ramone play W/Clay Learn Math" on both YouTube and Screencast-o-Matic. People ask me if they can use my material on blogs and web posts, lancer is by all means just a link back to wherever you got it. Find us on Facebook... and at the house of math. Got fractions videos to put up on the fractions page...it's been a couple YEARS that that page has needed work...passwords really are going to change shortly and many pages are going behind paywalls when in doubt use the sitewide password....and there's a slight chance that I have a live seminar/playshop here in Southern California...somewhere in "the valley"...in January meantime sometimes people figure rapidly that what's at the house of math currently is worth a whole lot more than $349.99. And I am quite serious when I say if you can find lessons that make math easy using base ten blocks post them here. This is what gets me out of bed in the morning. Got in another conversation about Khan Academy. Which is great, free lessons BUT they are "traditional" symbol based lessons with no pictures. No compound lessons and lots of memorization...and I have heard more times than I can count that watching the videos over and over again does not lead to understanding although you can remember the steps long enough to take the test--sometimes. I have had high school students tell me over and over again teachers basically let Khan Academy teach their classes for them and homework can consist of watching vids there. "if I didn't get it the firs time watching again and again isn' going to help although once in a great while watching it over and over again makes something click. I still have an "F" though." ~16 year old girl, with regard to Kahn. Same girl: "Holy crap! I watched your video one time and totally got it why didn't anybody tell me this before?" I find the explanations clear and usually concise, but again the algorithms are symbol based and I have an ace up my sleeve because I know what the symbols mean and the pictures they represent due to my familiarity with base ten blocks. Again it's not me it's the tools and understanding of their best use. Also you get compound lessons that teach more than one thing at a time. High school kids who tell me they hate the site because they hate math have no pictures or blocks. You'd hate English too if all you learned was letters like c o w but never saw a cow; chair could be confusing because they both have four legs and start with "c" but you've never seen a chair either...and nobody ever explained to you that those letters mean the thing you sit in as opposed to an animal from which milk can be had assuming you get a female. I have talked to more than one teen that was confused by Khan Academy not because Sal is a bad teacher but because he lacks tools other than symbols. Many have benefited from the vids there and he has many, many more than I do. Despite appearances I did not pay for this testimonial. The idea is that free or not, a huge amount of videos that explain math or not--it's not fun, kids often don't "get it" and it helps but still falls short for too many students, particularly female kenesthetic learners but also males. 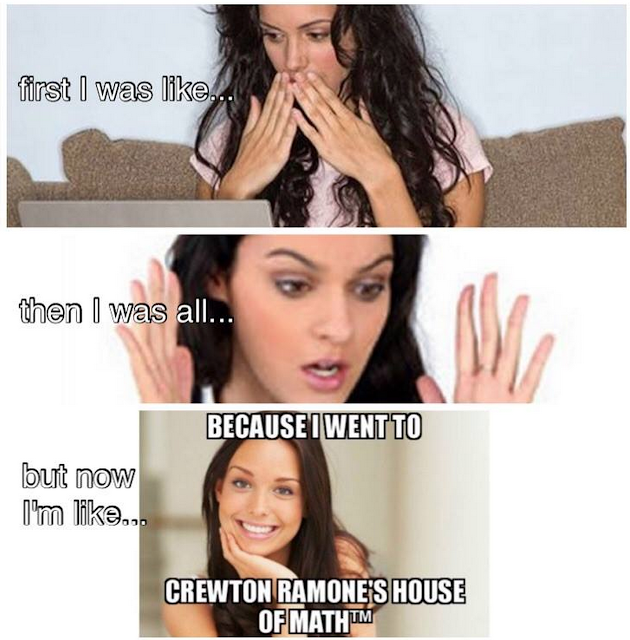 If you go through my blog and website, Crewton Ramone's House of Math you will see why this is a problem. It's just more of the same. It will work for a certain percentage of students...but my method works for a much greater percentage. "Gifted and talented" as well as challenged or remedial. I guarantee you most autistic kids do not prosper there at Khan Academy although there are a few for whom the method is perfect. The point is the base ten block method works for more students more often. Healthy Sibling Rivalry is a good thing. Problem: most people don't know how to use base ten blocks effectively and completely. They fall off right after basic operations and usually explain division incorrectly...and no one shows you how to subtract with addends. Nobody. 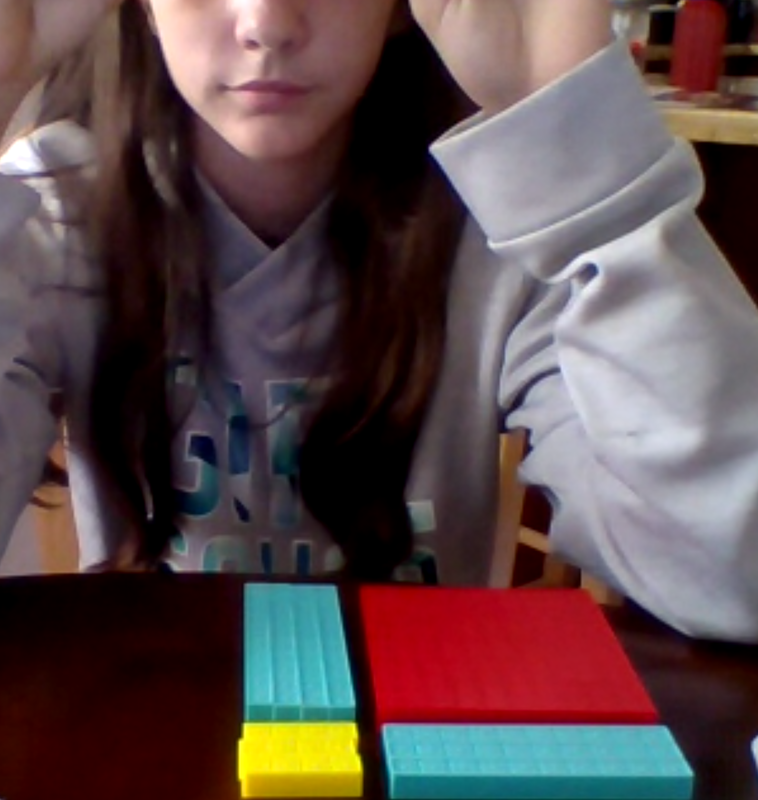 Most base ten block use is limited to addition & subtraction (regrouping) and that's it. My website needs a lot of work and I basically lost a year trying to build the Kajabi site out...so many lessons never saw the light of day because the threads weren't finished...so the pages never got published...all you got was the teacher training but I had several other stands like trig and algebra partially built. Oh well. Pretty much all of it is at the house of math NOW, just not in such a snazzy format and some of the vids are low quality because they were uploaded when I was having net problems...well I wasn't: the cable company was, but now it's all high speed. have to replace the low quality ones but first I have to replace or re-cut the screencasts that don't work at all anymore. Anyhow, I will work on the house of math this year and I think CrewtonRamone.com will come back online this year...also there are going to be some more Crewton Ramone in the kitchen vids...lots of stuff to do in the new year. Also many have asked for more "getting started guidance." More what to do first type stuff and then what to do after that...which is more concrete than "anything you want." Also need to revamp and add to the parent/teacher training and add more elsewhere too. Even where it's at now, if you go through all the training I have up currently you will be head and shoulders above most elementary math teachers. That's not hyperbole. Experienced teachers have been amazed. I show you how to use the tools to get more done faster without pain and tears but with joy and laughter. As I have heard more than once, it's life changing. DO not discount this blog and old blog posts, once you get some instruction or training you can see the method/theory in action here. There is information you won't/can't get anywhere else, like this. Here is a collection of vids showing a little history. "Thanks so much! I love your videos and materials and look forward to using them with my kids!